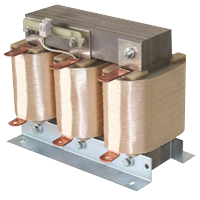 Wide range of copper and aluminium core reactors for detuned applications. Dedicated to attenuating the amplification of harmonics on highly polluted networks and to protecting the different components of the APFC system. Range of detuned reactors for applications in PF-control with LV capacitors for PF management. A wide range of copper and aluminiumreactors with detuning at 5.67%, 7% and 14%. Compact design and optimized heat losses and linear performance. Rugged and heavy duty range of MPP power capacitors for LV application. Smooth, fast and always at zero crossing. Thyristor switches for real time operation, in a precise operation. A wide range of configurations of compact and rugged units specifically designed for capacitor switching applications.